Weed eater recommendations? One you don't have to pull the cord 18 times to get it to turn over and stop every 5 seconds to get more string. I have a Black and Decker corded trimmer that I got from Wal-Mart for like $50 or $60 a few years ago. It automatically feeds the line out and is actually powerful enough to chip concrete. I know I can get the string at pretty much any big-box store or from Amazon. If you don't want corded, they also make a battery-powered version, but I can't personally vouch for it. Thanks! Leaning towards an Ego from Home Depot. I tad more costly but great reviews and the batteries work with their other stuff. Anyone here drive a Toyata Tacoma? I think I am dumping this FORD for one! Toyota are bulletproof, but Fords are supposed to be too? Hey, Georgie-boy, great to hear from you and even better to hear that you can vouch for the procedure. Sets my mind a little easier knowing you have first hand knowledge that it works. I have renewed confidence now, many thanks!!! I had no cow music playing through my nose, I'm sorry to say ... but if you haven't yet read "The Cows are Coming" by our very own Thomas Cranham (is Thomas still around? ), it's a must-read before the procedure. Great trucks. get a pre-runner if you can. It’s very cool they are doing a show just for the fan club. I entered contest #3 as soon as I got the email. Fingers crossed that I’ll be making another trip to SF this year. Hey, FWIW "The Dark Tower" has finally hit pay tv. It's now showing on "Showtime" and I believe it is airing tomorrow at 4pm AZ time. Tune in to see how, Hollywood fucked up a significant authors' "Magnum Opus" and lifetime epic!!!! Edit: Oh, and BTW I made it through the surgical procedure if anyone is still following this sad and sordid tale of woe!!! LOL As a bonus, the Doc was able to skip the "Shark skin" step which eliminates the need for a follow up procedure to remove it in 4 weeks and apply a graph of my own skin. This was due to the fact that the wound site was in such good shape as to eliminate the need, which is pretty cool in my book!!! Glad it went well, Bill. Really glad to hear you're doing better, Bill. My thoughts and prayers are still with you. Hang in there, Bill. Me and the family are thinking of you! I know this is a book collector site, but recently I've experienced a wave of nostalgia for my teen days. In general, buying a car is a money losing proposition, but a few cars go up in value and cost far more than 30-50 years ago. 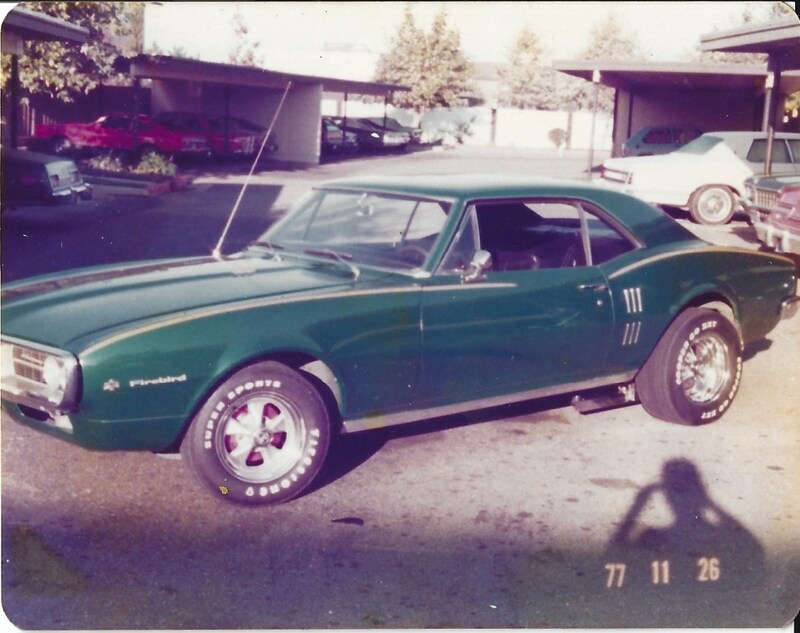 My first car was a 1967 Pontiac Firebird. I bought it when I was 15 years (1975) old (no license yet, permit was at 15 1/2, license was at 16). The car had sat in a neighbors driveway undriven for at least 5 years. It had 2 blown gears in the transmission, and deep rain,and tree sap stains in the paint. I bought the car for $200. I worked hard to repair/improve the car. I sold it in 1978 for $2,000. If I tried to buy the car today, it would cost at least $20,000! You should try and locate it, always a possibility today ... all you really need is the VIN. If not your own you could always go for another at not unreasonable prices, they pass across the stage all the time in the weekly Mecum and Barrett-Jackson auctions. Mecum will be in Portland in June, Monterey in August and Las Vegas in October along with Barrett-Jackson. 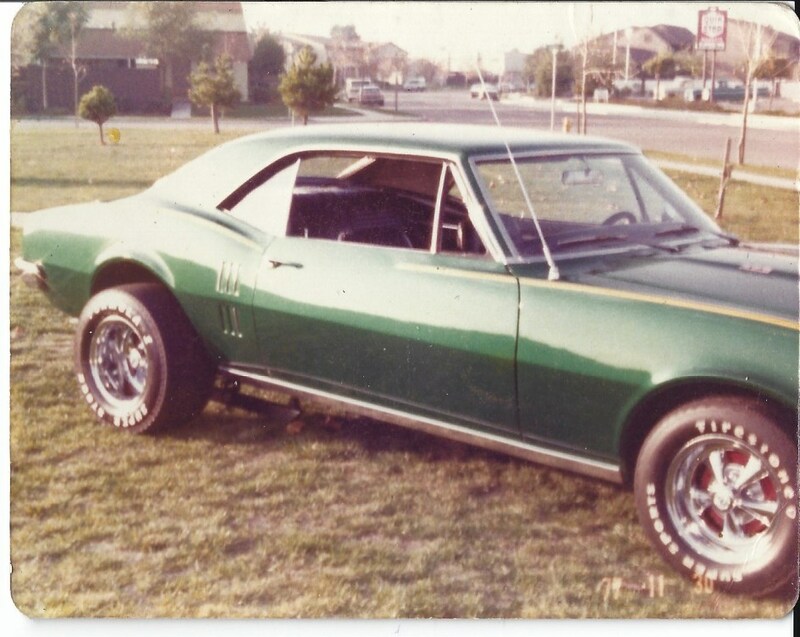 Growing up a guy a few blocks from had a '69 Firebird, Canary Yellow, white interior, white convertible top ... always loved that car. That's a sharp looking vehicle. Love that green paint job. 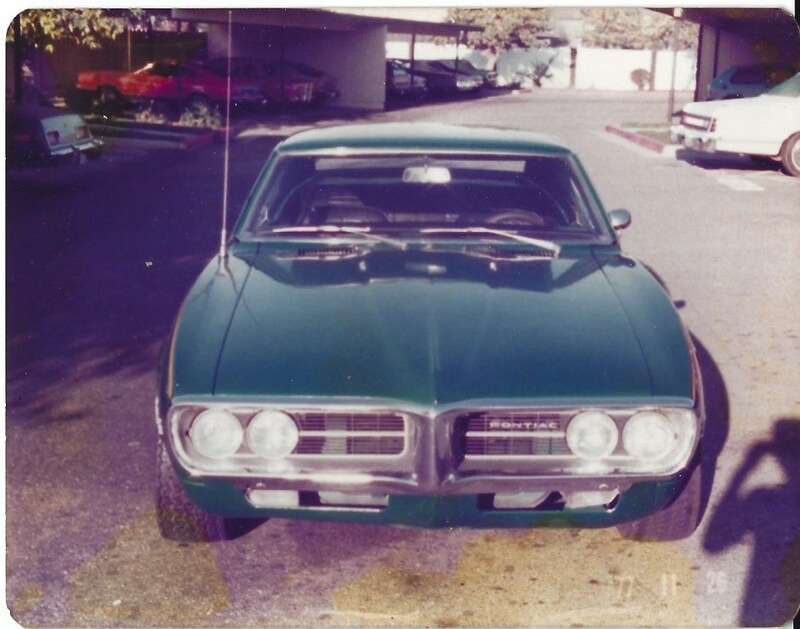 My first car was a '73 CUDA, just a 318 engine though, metallic blue with a racing stripe. I watched it being made on the assembly line because I was working at Chrysler at the time. Paid $3600 (I think). Sold it for $800 ten years later. I wish I still had it. I don't have the VIN, and I sold it (not kidding) to a military guy from Colorado back in mid 1978. As much as I loved the car, it was a stripped down version. It had NO power steering, No power brakes, 4 wheel drum brakes, no A/C, no power windows, the smaller 326 C.I. V-8 (not the desirable 400) almost no premiums other than a Muncie 4-speed with a Hurst shifter (weird choice on a 2-barrel V- . If I ever drank the Kool-Aid, I'd buy a fully optioned original convertible, or a nicely modified convertible. Somewhere between $25K-$65K. I don't have the VIN, and I sold it (not kidding) to a military guy from Colorado back in mid 1978. As much as I loved the car, it was a stripped down version. It had NO power steering, No power brakes, 4 wheel drum brakes, no A/C, no power windows, the smaller 326 C.I. V-8 (not the desirable 400) almost no premiums other than a Muncie 4-speed with a Hurst shifter (weird choice on a 2-barrel V-. My grandmother had a '57 Bel Air Convertible; she got rid of it due to a leaky radiator and bought a '64 Impala SS Convertible (I grew up in that). Dad had a '72 Road Runner and then a '75 Road Runner. Mom's boyfriend had a '70 Hemi Challenger. 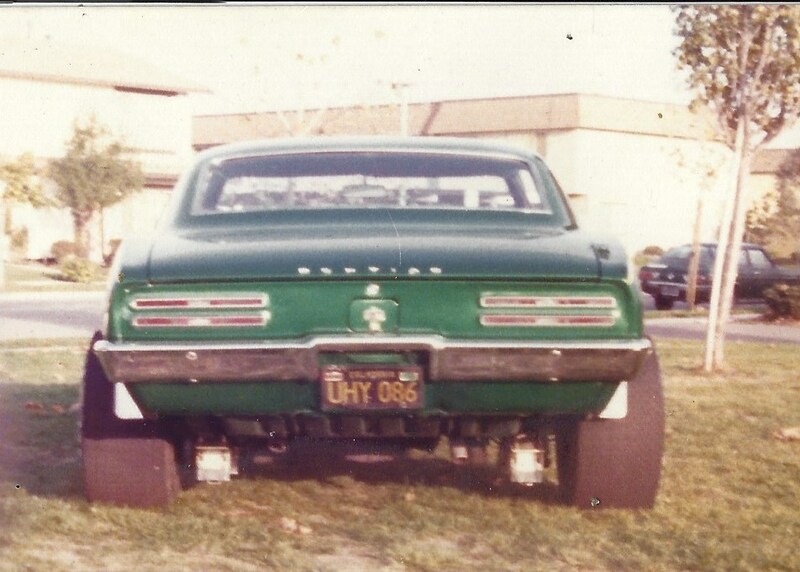 Of all these the Impala lasted the longest, my grandmother got rid of it after I'd been in the USAF many years, probably early 90's sometime; the floorboards had rusted out so she traded it in. I about fainted when she told me; she had no idea I would have wanted it. I was two in 1975. Just to make you guys feel more nostalgic . My first car was a 1975 Caprice Classic. I bought it from an old lady in 1990 with 60,000 original miles. It wasn't pretty but it got me from point A to B most days and big as a freakin' whale. Timing was a little off, but mine from a couple of hours ago was to the decorator asking when he was coming round to paint the living room! !